Custom print your return and recipient addresses on your A-7 Euro Flap Envelopes. We provide front and back flap printing. Please follow the guidelines below in uploading your design. We will contact you if any changes need to be made. Otherwise we will send out the finished piece if everything seems in order. Save time and the hassle on recipient addressing by leaving it to us! For additional inquires on recipient addressing, envelope color options and general printing questions, please contact us. File should be saved as the final finished size. It is not necessary to layout with multiples per page. Export your file to a ready-to-print Adobe PDF format. The artwork, as it appears on your computer screen, will not be consistent with print colors, since every computer screen renders color differently. 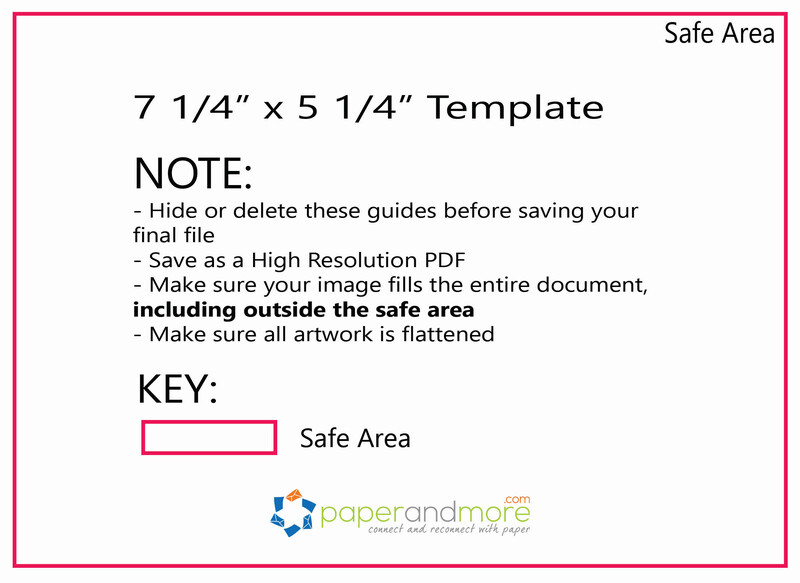 An on-screen proof cannot match the color or density of a printed piece. Even different programs on the same computer can render color differently. For these reasons, we cannot be responsible for color variations between submitted files and the final printed piece. To avoid layout mistakes that can slow down the production of your printed material. Please reference the templates below on how to properly include bleeds with your design files. These items are often purchased together with this item: A-7 Euro Flap Envelope Printing - Upload File. Click the right arrow (swipe on mobile) to view more items. Great print & envelope quality! Custom service was incredible with this order, I as had a lot of questions. They answered everything quickly & the envelopes were beautiful. The print quality is amazing. The coating on these envelopes is wonderful. Very happy with my purchase. The shimmer is exactly as listed. I was so delighted to learn that Paper and More could print out custom designed envelopes with guest addressing at a reasonable cost. It was simple to upload the merged file of my designed guest addresses. Each envelope was custom printed with each guests name in the font I picked. So not your typical envelope addressing and exactly what we we wanted for our wedding invitations - something different and unique. I could not find this service anywhere else.